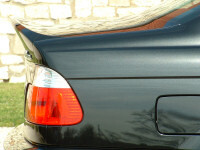 A lighter, more powerful version of the BMW M3 was introduced for sale in 2003. The BMW M3 CSL is quicker and more responsive than the standard M3 which makes it an authentic motor sport experience in a production car. A limited run of 1385 were built in Regensburg between June and December of 2003. In creating the BMW M3 CSL, which stands for Coupe, Sport and Lightweight, engineers at BMW’s M division succeeded in stripping ca. 150 kg from the M3. The result is a car that benefits from an impressive power to weight ratio of just 3.85 kg/bhp and accelerates from 0-100 kph (0-62 mph) in 4.9 seconds. Top speed is electronically limited to 155 mph, but can be de-limited to 280 kph (175 pmh) for holders of a 'C' racing licence. 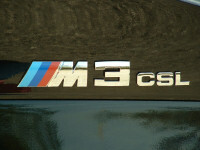 But the BMW M3 CSL, which is based on a concept first shown at Frankfurt in 2001, is not just about lighter materials. Designers were tasked with creating a car true to BMW’s motor sport heritage, right down to the last component. And by engineering a range of power and handling improvements, BMW has created a vehicle capable of breaking the eight minute (7:50) lap time at the famous Nurburgring, North Circuit in Germany. BMW’s M3 engine has received many accolades for being International Engine of the Year. An enhanced version of this 3.2-liter straight-six power house was developed for the M3 CSL. Power output has been boosted from 343 to 360 bhp at 7,900 rpm, while torque is up from 365 to 370 Nm at 4,900 rpm. BMW M’s most sporting and dynamic transmission features on the BMW M3 CSL - the paddle shift SMG gearbox with Drivelogic and new software. Based on F1 technology, it allows ultra-fast shifting through all six gears, using the gear stick or paddles, with changes taking just 0.08 seconds. Drivers can choose between sequential and automated mode. The optional 19” wheels and tires for the BMW M3 are fitted as standard but Michelin Pilot Sport Cup tires, with asymmetric treads developed especially for the BMW M3 CSL mounted on unique alloy wheels, can be specified as a no cost option. The tires, which are suitable for both road and track, measure 235/35 ZR 19 at the front and 265/30 ZR 19 at the rear. Complementing the performance of the car, they offer outstanding lateral grip, up to 1.6g, improving the BMW M3 CSL’s already remarkable handling qualities and cornering capability. To ensure M3 CSL owners are comfortable with the handling of these specially designed optional tires, dealers will explain the need for caution while they warm up and during very poor weather. Buyers will also be required to confirm that they are aware of and understand the unique performance characteristics. Center console and door trims are made of carbon fibre reinforced plastic and the M Sports steering wheel is clothed in Alcantara. To make best use of the reduced weight potential many features of modern cars normally considered as essential, such as air conditioning and a radio, are excluded from standard specification, but can be specified as no cost options if the customer wants them. Luggage compartment to VDA st.
1 Weight of car in road trim (DIN) plus 75 kg for driver and luggage.